July is typically the time when many Norwegians head abroad, seeking sun and relaxation in warmer, cheaper southern European countries. This summer’s holiday may be the most expensive in years, though, after a downturn in oil investments and the likelihood of extended low interest rates drove a 5 percent drop in the Norwegian krone against the euro in the space of just two weeks. On Thursday, newspaper Dagens Næringsliv (DN) reported one euro was worth 8.44 kroner, up from 8.02 kroner a fortnight ago. It put the krone in its weakest position since Christmas and was approaching the levels of the summer of 2009, in the aftermath of the financial crisis. The krone is now at its weakest summer level in five years against both the euro and the UK pound, while it also costs nearly 6.2 kroner to buy one US dollar. One of the key reasons for the drop in the krone’s value was the decision by Norway’s central bank (Norges Bank) to leave interest rates at an historic low last month. The decision followed a report by Statistics Norway (Statistisk Sentralbyrå, SSB) showing oil investments had been weaker than expected. Higher interest rates drive the purchase of the krone, leading to a stronger currency, while lower rates have the opposite effect. For those wanting the most bang for their buck on their summer travels, Eek-Nielsen said Turkey was the place to go. The lira was one of the few currencies that had weakened against the krone, falling 8 percent since last summer. At the other end of the scale, the pound rose 13 percent and the euro 6 percent against the krone. That means Norway is now the cheapest it has been in years for British and European vacationers, and Americans are getting some relief as well. DN spoke to one group of young Norwegians at Oslo airport on Wednesday, who said they were aware of the weaker krone but it hadn’t affected their Spanish travel plans. The four said they would stick to their budget of between 50 to 100 euros a day, but would have to prioritize their spending. Tour operators and airlines said the current currency issues had little impact on Norwegians’ holiday plans. “We send 360,000 tourists on trips every year, and they tend to spend a little less on shopping and are a little more careful about what they buy when the krone is weak,” said Lena Petterson from Star Tours. She said Turkey and Bulgaria remained affordable options. 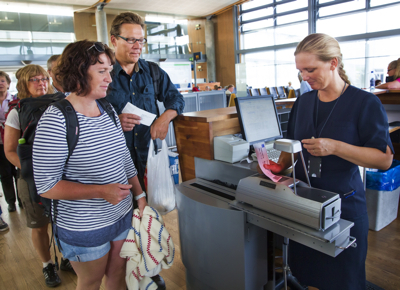 “People go on holidays regardless, and it has not made any impact on our booking patterns,” said Norwegian Air’s Lasse Sandaker-Nielsen. “People want sun and warmth.” He said Spain, Greece and other Mediterranean destinations were as popular as ever. DNB Markets analyst Magne Østnor could not rule out a further decline in the krone, and said it could continue to weaken through the summer. “We can get a test from last year’s weakest level against the euro around 8.50, and see levels between 8.40 and 8.50 in the next days and weeks,” he said. Østnor predicted the krone would eventually bounce back. Meanwhile, Eek-Nielsen told DN he didn’t think there would be any interest rate cuts over the next couple of years, despite the market’s belief there’s a 50 percent chance and Norges Bank’s signals of a 20 to 30 percent likelihood of cuts. While imports into Norway will be more expensive, the weaker krone is good news for exporters as foreign buyers will get more for their money. Nevertheless, Eek-Nielsen argued the effect of more expensive imports was more important than that of cheaper exports. “It is good for Norwegian exports and the economy when the krone is weaker, but that hardly weighs up for the effect of lower oil investments,” he said.